The RAM Adopt A Village (AAV) Program was developed by Ron Seddon and others in PNG in 2002 and then adopted in the Solomon Islands as the main form of fund raising to support RAM’s pioneering distribution of Long Lasting Insecticidal bed Nets (LLINs). After several years in both countries the challenge, of providing universal access to LLINs for the entire population, was taken up by the very well-resourced Global Fund to fight Aids Tuberculosis and Malaria (Global Fund). In the Solomon Islands RAM was able to provide solid practical advice and facilities such as storage sheds and staff accommodation to support the Global Fund program. 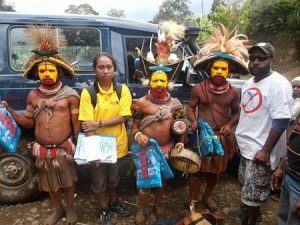 In PNG, RAM initially also provided a procurement service for LLINs funded by the Global Fund before being appointed by the Global Fund to manage the net distribution programs. RAM employs permanent staff through the Rotary Club of Port Moresby to administer and deliver the programs and to date has delivered LLINs to every household in the country twice and with further assistance from the Against Malaria Foundation RAM PNG is progressing the third round. Since the Global Fund was prepared to fund the distribution of LLINs, that had previously been planned by RAM and supported by AAV, the funds were preserved until their best use was determined. RAM has now adopted a policy of strategic distribution of LLINs funded by AAV and ongoing RAM fund raising to compliment and support the work of the Global Fund. RAM now supplies nets to cover gaps and short-falls in the Global Fund distributions in PNG, Solomon Islands and Timor Leste working closely with the National Health organisations in each country. RAM also supplies nets for specific needs groups such as expectant mothers, institutions such as orphanages and in support of programs such as ‘Chasing Malaria’ and ‘Healthy Villages’. RAM is also prepared to provide Rapid Diagnostic test kits (RDTs), specialised bed nets, treatment drugs, insecticide and educational resources as well as support for local health volunteers. Distribution of LLINs funded by RAM in Timor Leste commenced in 2012 and so far 74,000 nets have been supplied including 40,000 nets to ensure that all expectant mothers and their babies were protected from mosquitoes and 1000 special conical nets for hospitals. 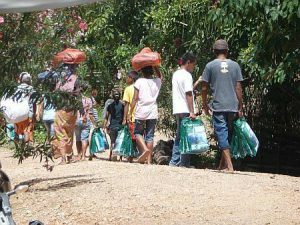 On the left villagers in Timor Leste start the long walk home with their precious LLINs supplied by RAM. LLINs have an effective life of three to a maximum of five years if cared for and so until we have an effective vaccine and have eliminated malaria from these areas RAM is committed to replacing the nets as required to keep these populations safe. Your continued support of RAM’s programs and the encouragement of all the Rotary Clubs in Australia will help us achieve this whilst we support new initiatives to eliminate malaria permanently. For details on how to donate for the Adopt a Village Programme, click here.